We all have to transport our dogs in the car at times. We might be going to the vet or the groomers, or just taking them along for the ride. Most dogs go wild with excitement at the jingle of the car keys or when they hear the phrase, “Wanna go for a ride?” Riding in the car is a treat, and another opportunity for us to spend time with our dogs. 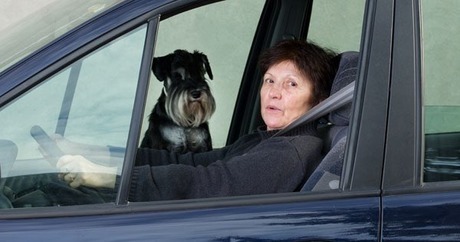 We’ve got about seventy-eight million dogs living in households in the United States and 56% of dog owners say they drive with their dog or dogs in the car at least once a month. That’s a lot of dogs riding in cars! Many unrestrained dogs love the shotgun and front seat areas because they are near their favorite human, and can stick their heads out the window to get that wonderful breeze that dogs love so much. However, an unrestrained pet in a moving car is always in danger. A dog can be thrown out the window, or through the windshield if you have to make a sudden stop or have an accident. Airbags are an issue as well, they pop out of the dashboard with enough force to severely injure and in some cases kill a dog. Allowing your dog to ride in the front seat also means they can interfere with your driving: some dogs love climbing into your lap when your driving, while others climb down onto the floor where they can get in the way of the gas pedal or brake. Did you know that looking away from the road for only two seconds doubles your risk of being in a collision or accident? According to a survey conducted by AAA and Kurgo the most common distraction our dogs provide in the car is that we tend to take our hands off the steering wheel to pet them. That’s a big problem. “An unrestrained 10-pound dog in a crash at only 30 mph will exert roughly 300 pounds of pressure, while an unrestrained 80-pound dog in a crash at only 30 mph will exert approximately 2,400 pounds of pressure. Imagine the devastation that can cause to your pet and anyone in its path,” said Huebner-Davidson AAA National, Traffic Safety Programs manager. This is why it’s so important to restrain your dog while driving. Most dog owners claim that they know about safety seat belts and harnesses for dogs, but they don’t use them because their dog is “mellow.” It’s important to note that a mellow dog flies out of a car window just the same as a hyper dog in the event of an accident. The safest way to ride with your pet in the car is to get a pet seatbelt or restraint, but do your research before selecting a brand. Until recently, there has been no independent safety testing of car harnesses for dogs, and buyers had to rely on the manufacturer’s claims. That’s changed since the independent non-profit Center for Pet Safety did crash tests under the same conditions the Federal Motor Vehicle Safety Standard established for child safety seats. Their results: it was a bumpy ride for some brands, with only 7 making it through the initial crash test without catastrophic failure. Most of these dog safety belt manufacturers aren’t big corporations, but small companies whose owners really do care about dogs. After independent testing, some of these companies were proactive, and re-engineered their safety belts and harnesses to help them perform better. The top-rated harness was the Click Utility is made by Sleepypod. The second-ranked dog safety restraint was the AllSafe, made by a German company called Kleinmetall. Instead of using the tether that comes with the harness, you can pass the car seatbelt through the back of the harness itself. You don’t have to trade comfort for safety either, dogs can get comfortable and sit or lay down while wearing their safety harness. Most dogs aren’t going to be exactly thrilled when you buckle then in the first time but they will get use to it, and it will become habit. Once a dog gets use to being buckled in, they will sit patiently as you gear them up for a drive, just like some do for a walk. It should go without saying that allowing dogs to ride in the back of a pick-up truck unrestrained is a recipe for disaster. Not only will a sudden stop cause serious injury to the animal, they could easily jump out into traffic and be killed by another vehicle or cause a bigger accident. Never, ever do this no matter what. Bottom line: It’s important to use common sense and take the necessary steps to protect our K9 cargo when it’s time to hit the road. It’s so much better to be safe than sorry!